Some opportunities just cannot be passed up, so when we were invited to New Jersey to spend the 4th of July with our dear friends, we simply couldn’t resist. It was a hefty 13+ hour drive from Nashville and we pulled into our hotel at 3am the morning of the 4th. POOPED! Whilst we didn’t think we would make the 8am street party, after only a few hours sleep, we even surprised ourselves. We were there in the front row, all set up and ready to go BEFORE the parade even started!! The kids had an empty bag each, in preparation of the candy that was to be thrown from the cars and floats cruising down the street for the parade. 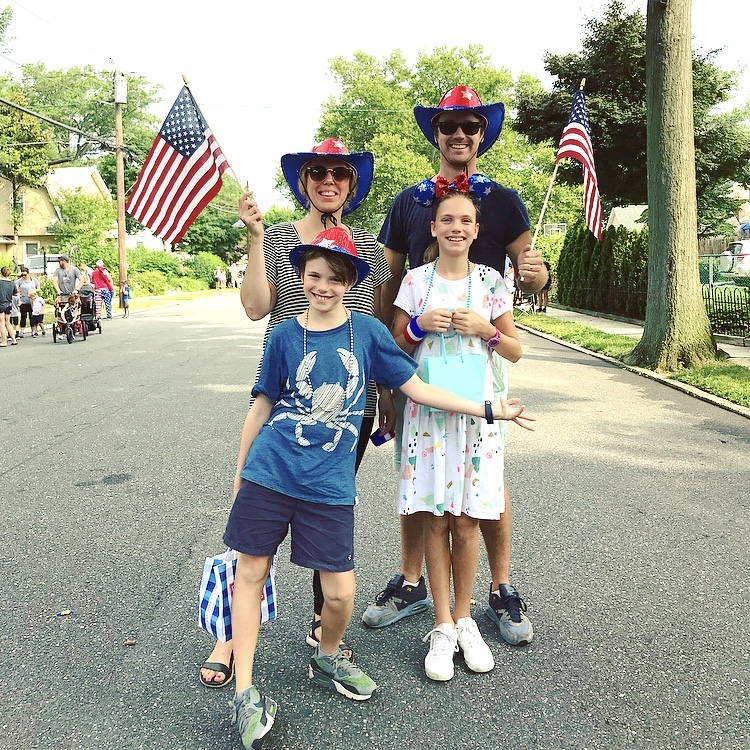 By the time the parade ended – their bags were overflowing with American sweets, and they were thrilled!!! After the parade, we cruised to the local Fire Station where they were hosting their annual 4th of July fundraiser. Beer and hotdogs! We lined up for beer and the kids rode the fire truck – so much fun!! Another hot American summers day – finished off at the local high school sitting on the bleachers watching the incredible fireworks show! So grateful to our wonderful friends for showing us how 4th of July is done. What a brilliant day. So American – so fabulous! Off to watch the fireworks! We spent the next day at the local swim club. Picture the scene in the Sandlot Kids movie with the lifeguard in the chair. The pool over flowing with children. Bunting flags overhead. Sun beaming. It was fabulous. The kids had to prove they could swim, in order to gain a wrist band for the diving boards. They needed to swim 2 laps well, then tread water for 5 minutes. 5 minutes is a long time for little legs, but they passed with flying colours. My little fish gained their wristbands and a little extra confidence which never goes astray. Another epic day had! Puffed! But look at the arm band – well deserved! Our last day in NJ – we went bowling, played games, sipped beer in the back yard, made pancakes for dinner and enjoyed an incredible sunset. We feel so lucky to have had the time to stop for a few days and reconnect with friends. We met these guys in Melbourne 5 years ago and it was just so special to see them all again. The kids got along so well. Just as they did those years ago. We left Jersey with full hearts, so thankful for our time here, but also sadness that we have so much distance between us. So long friends. Same time next year?!!!! Next stop – NEW YORK CITY!!!! !